Boaters, anglers, and swimmers, you many want to think twice before heading out into Lake Michigan today. Forecasters are predicting waves swells as high as 7 ft, creating dangerous conditions for any one in water. The high waves are the result of an unusual weather pattern expected to continue into tomorrow. A small piece of the polar vortex has dropped down to the southern Great Lakes, bringing fall-like weather to parts of Michigan, Wisconsin, Illinois, and Indiana. The cool air may be a welcomed break from July heat, but the shifting weather is not without its downsides. 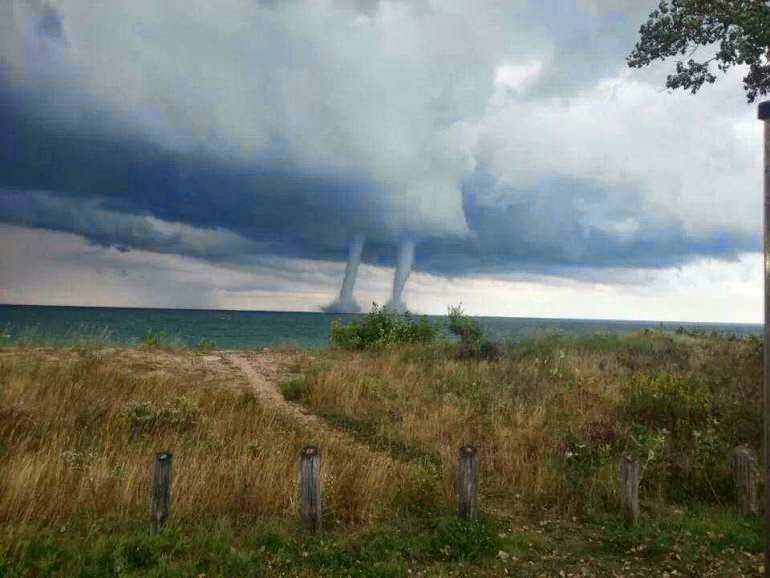 Right now, parts of the lake are actually warmer than the air above it, creating the perfect conditions for waterspouts. The wave swells created by gusty winds also bring a higher chance of rip currents, especially along Michigan’s western shore. Whether you are planning a trip to the lake or not, you can track wave height and other lake conditions in southern Lake Michigan as the strange weather continues with the IISG real-time buoy. *The week’s strange weather brings a chance of waterspouts like this one captured near Winthrop Harbor in 2013. Photo by Phil Mathis.